Looking today through my photographs from just a few weeks ago (late November), I was surprised how different the scenery looks than what is outside my window now. In the photos many of the trees still have bright fall leaves. The air seems crisp rather than wet. People are not wearing hoods. It's now about a month later, the second day of Winter. The whole landscape seems visually quieter but the change was by such gradual degree I barely noticed. Thank you, photographs. interesting gestures and forms, absurd signs, the usual stuff that sates my b/w habit. When I look at those photos now I don't see those things first. Instead I notice how warm and bright everything looks. People are sweating. They're wearing t-shirts. They have sunglasses. The gestures and forms, the essence of what I thought I was shooting, are somewhat buried in the season. Of course the opposite is true too. 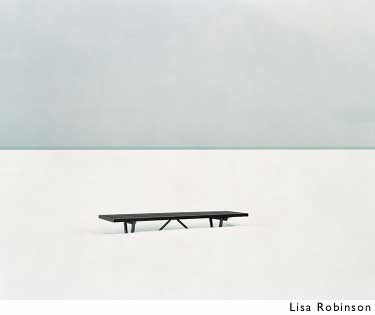 In summertime, photos of snow and ice seem especially powerful. Lisa Robinson's photos had a strong run on the critical circuit last summer, as did Camille Seaman and Joel Tettamanti's project Qaqortoq. What would these photos look like to an eskimo, or someone else who lived snowbound most of the year? They might still be strong photos but perhaps without the visceral impact of the exotic. 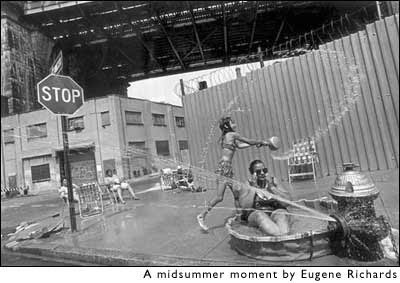 All I know is that Eugene Richards photo above looks more inviting now compared to the last time I saw it in September. Getting wet this time of year is too routine to be fun or even noticeable. The computer keyboard too becomes more familiar in winter.